The most common question we are asked about our wines is if we add sulfites. Like virtually every commercial winery, yes, we do add sulfites. It is not at all uncommon for people to attribute the occasional wine intolerance to added sulfites, but in reality, sulfite intolerance is very uncommon. 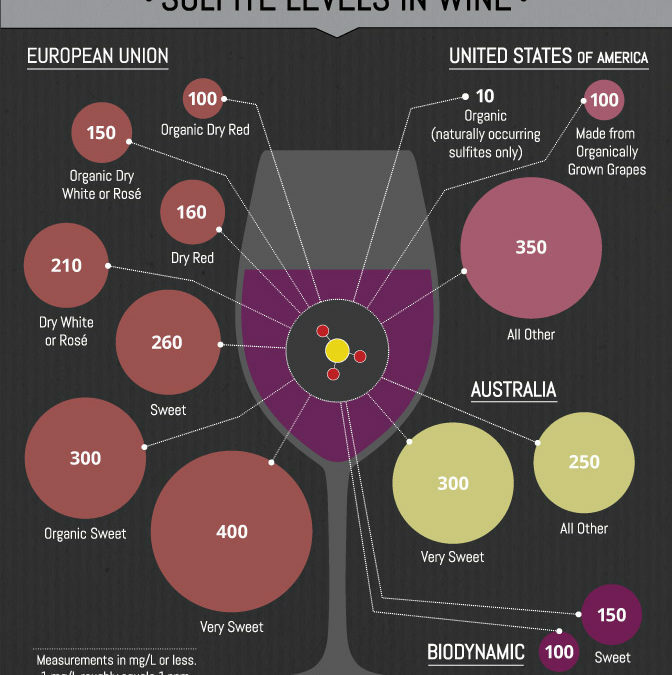 Sulfites are present in all wine; the fermentation process produces sulfites in as high of a concentration as 20 parts per million, whereas added sulfite seldom results in a concentration of greater than 70 parts per million. By comparison, dried fruits often contain in excess of 600 parts per million. The point is that if one can eat a handful of raisins without any problem, but gets a headache from a glass of wine, the culprit is not sulfite, but one of the many other substances present in what is, by any measure, a very complex beverage. Very few winemakers refrain from adding sulfites to their wines for one simple reason: it is possible to make a good wine without sulfites, but it isn’t either easy or reliable. Sulfites are essentially preservatives, providing antibacterial and antioxidant properties. Having made wine for over 35 years, most as an amateur winemaker, I have made some very good wines, a lot of mediocre wines, and a few bad wines. I have come to the unavoidable conclusion that it’s not really that hard to make a good wine if the winemaker follows two simple rules: use the best grapes available and don’t screw up. As an amateur winemaker, every subpar wine I ever made was a result of one of two factors: the grapes I used weren’t always the best, or I failed to use enough sulfite at the right time. With the recent trend in our society toward natural or organic foods, it is logical that some winemakers would go the natural route and market their products as organic. The problem with this approach is that there is a tradeoff, and in this case that tradeoff is the very likely presence of “funky” aromas and “mousiness” in sulfite-free wines. These results aren’t universal, but are a regular occurrence. Some (not very many) winemakers contend that sulfite-free wines have added complexity and “strangeness” and that these characteristics are desirable. I disagree, as do the vast majority of winemakers. While the use of sulfites are virtually universal among winemakers who aspire to produce great wines, as one would expect, there are many different opinions as to how much sulfite is enough, how much sulfite is too much, and when are the optimal times to add sulfite. Some add sulfite immediately on crushing to kill any wild yeasts before adding lab yeasts, while others like to wait until primary fermentation is complete before “sterilizing” the wine. Some add as little as they believe will serve their purposes, while others prefer to err on the high side. Personally, we have varied our approach over the past few years after discussing sulfites with a number of other winemakers, and have settled on the scientific approach. We vary our sulfite addition based on the pH and alcohol content of the wine. Less sulfite is needed at a lower pH (more acidic) and with higher alcohol concentrations. One of the great things about winemakers is that, as a group, they readily share their expertise, even with potential competitors. There are many expos, wine-sharing events, seminars, etc. where winemakers freely compare notes. At one such event, we had the opportunity to share one of our wines with the owner of the vineyard and winemaker that supplied the grapes. When he tasted the wine, he asked “Is this ours (meaning from their vineyard)?” when we informed him it was, he replied “you didn’t add enough sulfite.” We really appreciated his honest and direct criticism. While our wine was good, he tasted a subtle fruity flavor that wasn’t optimal for this particular varietal. The fruitiness could have been a result of a different strain of yeast or one of many bacteria that make subtle changes in the character of wine. I could claim that our wine had a complexity that theirs didn’t, but in reality, I agree that theirs was better. Among the choices that a winemaker makes is matching a laboratory-produced yeast with a varietal that enhances desirable characteristics, such as aroma, taste, mouth feel, etc. of that particular wine. If a winemaker goes to the trouble of using the optimal yeast, it only makes sense to obliterate as many contaminating microorganisms as possible, to allow the optimal yeast strain to produce an optimal product. Luckily, the differences were fairly subtle, and our wine was very good. The results could have just as easily been a very mediocre wine. The bottom line is that to produce the best wine, the vast majority of winemakers agree that the addition of sulfite is not optional. The key is to add enough but not too much to produce the best product, adding enough being considerably more important than not adding too much. True sulfite sensitivity is uncommon to rare, and the only known reaction to sulfites is similar to asthma, not headache or stomach upset. The vast majority of good wines, and ALL great wines are supplemented with an appropriate amount of sulfites. There are always trade-offs in life, and choosing an organic wine is one of those trade-offs. The consensus opinion among winemakers is that the risk of adverse effects of sulfite in a very small segment of the public is miniscule compared to the potential pleasure of drinking a really great wine.